The Atlantic chair and stool series from CHAIR DEPOTS Inc. Are our hand welded, polished, sanded and aluminum-anodized products. Its strong structure, light weight and anti-rust advantages keep attracting lots of full-aluminum seating fans. We are so proud to introducing you with our Atlantic aluminum seating products that is powdered by our continuous innovation on developing new products each year to meet your growing diversity seating demands. 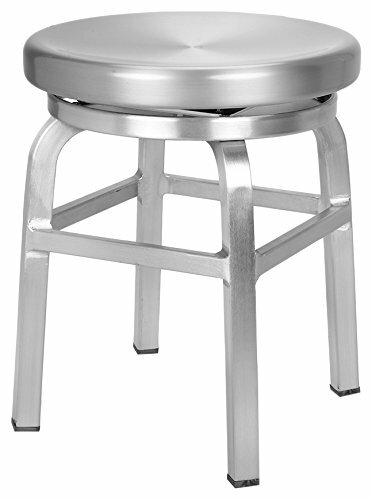 USAGE: Aluminum Swivel chair height stool for Indoor and Outdoor use, All aluminum welded, for both commercial and residential market. FEATURES: Brushed aluminum finish, contoured comfort round seat in Dia. 15 inches, Seat Height 18 inches, nylon skidproof glides. PACKAGE: Packing with 1pcs a carton, fully hand welded and assembled seat with No more assembly needed. STRENGTH: Using strengthened aluminum and ALL welded structure, makes it able to bear weight up to 450lbs. MAINTENANCE: Wipe with ONLY clean water then dry it with dishcloth. If you have any questions about this product by CHAIR DEPOTS, contact us by completing and submitting the form below. If you are looking for a specif part number, please include it with your message.